A Billion People Can't Be Wrong: Just Dance! We can learn so much as we dance through the changing seasons of our lives. Such was the case for our Chinese friend, Da Chun. It had been five years since she returned to her homeland. 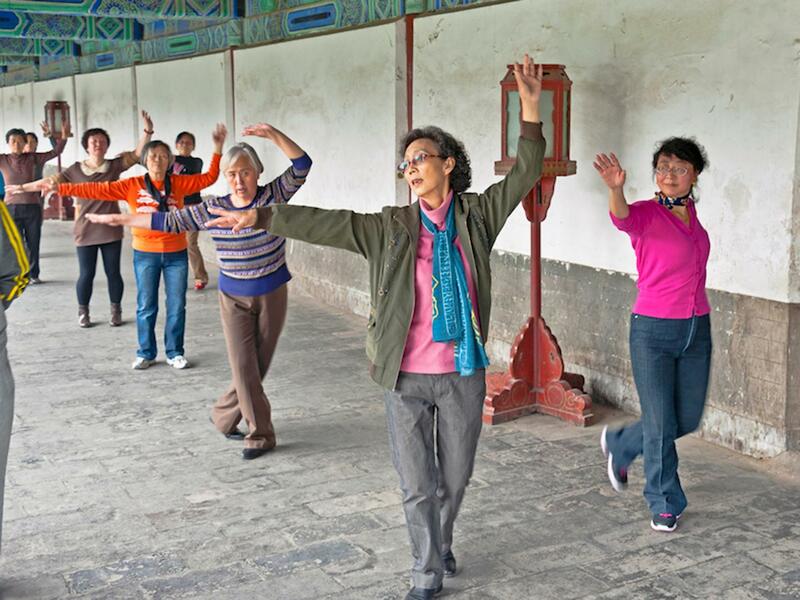 As we walked along the pathway to the Temple of Heaven (Tiantan 天坛 in Chinese), we noted all the elderly people engaged in taichi, dance and song. Ironic. Through our conversations, we discovered that we’re around the same age. Yet my husband and I didn’t even consider ourselves “old” at the time. We were right in the middle of our parenting years, with kids ranging from nine through 14 years old. When Da Chun first came back to China after two years of graduate study, she discovered that she really stood out. She spoke her mind and expected others to do the same. Gradually she learned she could no longer do that, learning to temper her ideas, at least expressing them. She found the reentry shock great. She told of a Chinese professor whose wife was pregnant with a second child. He was the one who decided that they would try for a second. He ended up being charged with a fine and publicly decried. Refusing to pay the fine, he faced dismissal from his job. This incident produced big headlines in Beijing when it broke. She believes he was used by the government as a scapegoat to cause others to comply. And, it worked. Now, though, she could share openly with us as we wandered around that fabulous place of history. She told of her boyfriend who lost his life in Tiananmen Square. The Chinese authorities at the time muted the loss of his life. She sought justice but failed to find it. This affected her for years. Finally, she got married to a colleague at work. They had a son and lived a “normal,” conforming life in China as it raced towards economic primacy in the 1990’s and early 21st century. Da Chun moved up the ranks in her government position. In fact, she was able to secure a scholarship to do graduate work abroad. Not long after, she landed on our doorstep. Another one of Da Chun's many changing seasons. We got to know Da Chun in the context of a student. But she was really a wife, mother, worker and party member. Our times together were sweet, and we shared openly about many aspects of life over those years. Her marriage suffered during those two years away, eventually leading to divorce. This is a fairly “normal” arrangement – and consequence – among China’s intellectuals. She retained the custody of her son. Da Chun always had an inquisitive heart and spirit. She asked many questions of what Christians believed and watched them closely. She clarified that, while she appreciated what she learned from the many Christian friends she made in the U.S., she now feels that Buddhism suits her better since she is in China. When we visited, she was dating a Chinese Christian man – a teacher at the same school where she had done some part-time instruction. But her then 17-year-old son was not privy to that information. She didn’t want to consider marriage until her son would sit through the gaokao, the competitive entrance examinations for university. She wanted to wait until after to explore the options available to her. She said that if they get married, she plans to go to church with him. At the time, they had agreed to disagree in the area of religion. Da Chun’s research and policy roles led her to a place of prominence in the Chinese apparatus. She developed an expertise in trade policy analysis. She admitted that, while she found the Bush policy between 2000–2008 quite black-and-white, Obama’s more nuanced style proved more challenging. “Do you know what he is doing?” she queried, almost as if we had an inside to White House policy makers. We smiled. We philosophized for awhile, and then found minds back in the present, enjoying the laughter and music in the park, the scene of a young couple getting their wedding pictures against the backdrop of Tiantan. Children ran around squealing. This woman had seen so much. It seemed as if she was yet again going through another one of many changing seasons in her life. But she knows, even if she slows down, there remains so much more ahead. American culture tends to idolize youth. What can Americans learn from Da Chun and China about the treatment of the elderly?